I recently utilized Firebase to power the database and back end of an AngularJS web application I’ve been working on. 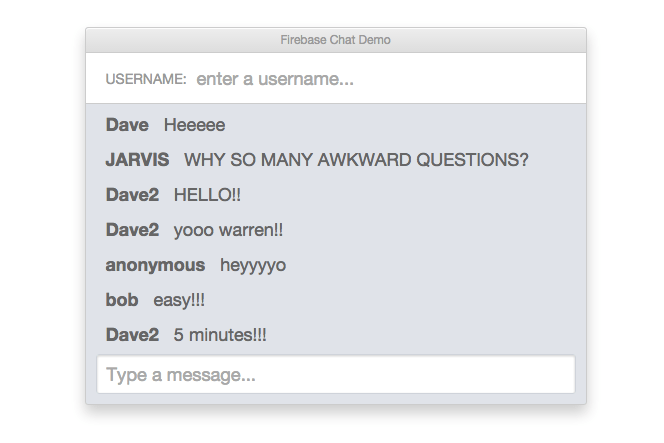 Firebase was proved to be amazingly easy to setup. Their “5 minute quick start” sold me on the utility of this service. How easy is it? Let’s go ahead and create ourselves a persistent chat client in about 5 minutes. I’ll assume you’ve had some previous experience with Angular, but it’s not required. Now, you need to create a reference to your Firebase database inside your script tag. When you sign up (for a free, even! ), Firebase will give you a random URL that links to your new database. Okay, okay. Not too bad. How do you start sending data to your new Firebase DB? You just apply some Firebase methods to the reference we created about. In this case, we’ll use the set() method. // Store values from our input boxes here. // to the values above. // Save to our Firebase DB using the .set() method. Another option that you can utilize to store data inside Firebase is the push() method. You can utilize this method to easily create lists of objects. And just like that, you now have a working chat client supporting many users and can share data to all clients using it. Amazing! Next PostNext Using the Mongo CLI to find your data.